ictor loves chicken wings. Cameron loves video games. Angelo loves his French Teacher, and Daniel wants to change the world. Add Marla, the mysterious girl-next-door with a dark past, and watch a group of “regular” kids try to find love and meaning in the doldrums of the Suburbs. 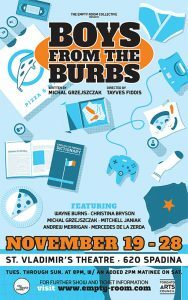 Set in 2002, Boys from the Burbs is the a comedic coming-of-age story about growing up in the suburbs.